If your dog spends lots of time outdoors, tick checks should be part of your daily routine. Here’s how to spot a tick – and what to do if one has grabbed hold of your pet. Start by running your fingers slowly over your dog’s entire body. 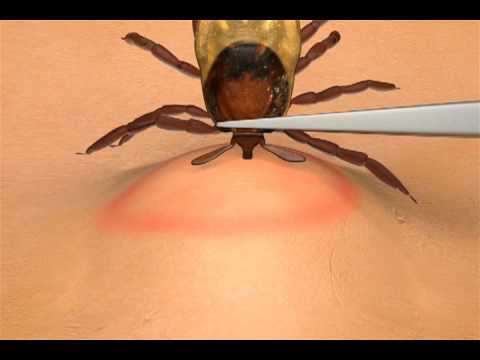 If you feel a bump or swollen area, check to see if a tick has burrowed there. Don’t limit your search to your dog’s torso: check between their toes, under their armpits, the insides of their ears, and around their face and chin. Step 2: Is it a tick? Ticks can be black, brown or tan and they have eight legs. They can also be tiny: some species are only as large as the head of a pin. Stay Safe! Always wear gloves while handling ticks to avoid contact with your skin. 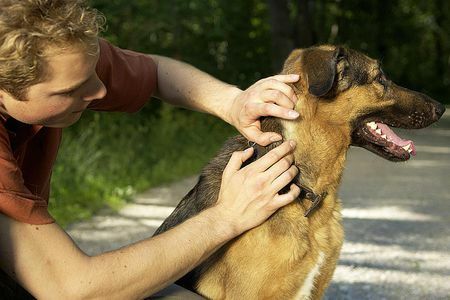 Grasp the tick as close to your dog’s skin as possible (without pinching your pet). Pull it out in a straight, steady motion. Anything left behind could lead to an infection. Gently press the remover against your pet’s skin near the tick. 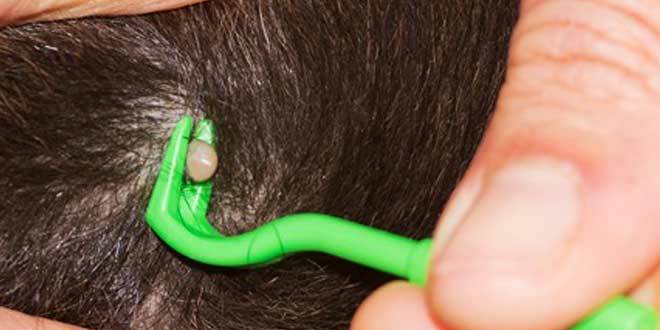 Slide the notch of the remover under the tick, pulling it free. Drop the tick into isopropyl alcohol and note the date you found the tick. If your pet begins displaying symptoms of a tick-borne illness, your Dr. Anderson may want to identify or test it. Wash your hands, clean your pet’s wound with antiseptic and make sure to clean your tweezers with isopropyl alcohol. Keep an eye on the area where the tick was to see if an infection surfaces. If the skin remains irritated or infected, call to schedule an exam. Watch your pet for symptoms of tick-borne diseases. Some symptoms include arthritis or lameness that lasts for three to four days, reluctance to move, swollen joints, fever, fatigue, swollen lymph nodes, loss of appetite and neurological problems. If you or your companion animals spend any time outdoors, you should routinely check for ticks. Ticks transfer between hosts, so it is important to check all family members after outdoor activities in wooded, leafy or grassy areas. Comb your pet regularly with a flea comb, vacuum frequently and dispose of the bags immediately after use, mow areas of the lawn where your dog spends time, wash pet bedding weekly, and wash your pet with a pesticide-free pet shampoo. In many areas of the United States, ticks are active year-round, even after a killing frost. Dr. Anderson advises all client to keep pets on flea and tick prevention year-round. Call and speak with our reception team to help you decide which preventative is right for your pet.